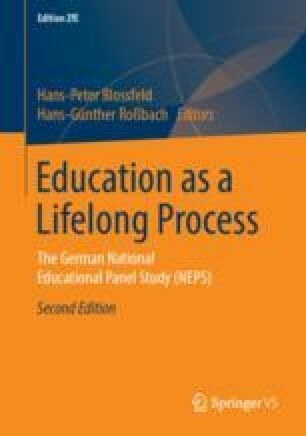 This chapter introduces the scope and research program of Stage 4 of the German National Educational Panel Study (NEPS). Stage 4 follows the target persons through secondary education up to their transitions to higher secondary education, vocational education and training, or direct entry into the labor market. From a life-course perspective, this stage allows us to monitor individuals’ educational trajectories in lower secondary education as results of a dynamic interdependence of educational decision-making, different learning environments, and competence development while also paying attention to the educational careers of migrants and returns to education. Following a general introduction, this chapter gives an overview of the general survey program of Stage 4 regarding the tests and questionnaires administered to students as well as the questionnaires and interviews administered to their teachers, principals, and parents. It then goes on to outline the specific research focus of Stage 4 on the interrelated development of reading and orthography as well as on the cognitions, attitudes, and behaviors related to these two competencies. With regard to orthography, stage-specific tests are applied to assess the students’ competency trajectories in this crucial domain. With regard to reading, Stage 4 focuses on the development of students’ reading engagement. A third key aspect of the stage-specific research introduced in this chapter is the quality of instruction.